Joe Robinson and James Thomas went into business for themselves as general contractors in September 2009, dba as Unlimited Carpentry. Like most small business owners, they’ve invested a lot into building their business and reputation as experts in their field of general contracting. 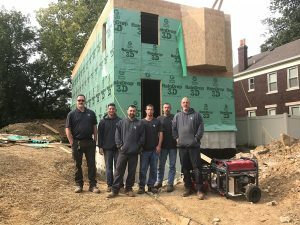 And over the past few years, they’ve been great contractors and now private developers, sharing the Landbank’s vision to make a difference and improve neighborhoods around Greater Cincinnati. Joe and James began working for the Landbank as a general contractor for rehabs in Evanston, beginning in October 2016. Evanston is one of ten neighborhoods included in The Port’s Transform to Prosperity vision, with the aim to revitalize ten communities, create 300 quality, productive homes, increase property values, and help to drive economic self-sufficiency with a leave behind investment in each of the communities. Having witnessed the transformation and revitalization firsthand, Joe and James knew they wanted to be a bigger part of the work The Port was leading. And so when a property became a new project for them as general contractors, they wondered if they might be able to do a little more. Okay, a lot more. They wanted to invest even more and move from general contractor to private developer and purchase a property on Ruth Ave, a home that was unfortunately too blighted to save and had to be demolished. The revitalization and growth in Evanston is not the only area Joe and James have seen expanding. As small business owners, working with The Landbank has afforded them more consistent and regular projects, enabling them to transform their business from a team of two, with three sub-contractors, to 8 full time employees. “Since we started in October 2014 as a general contractor for The Landbank, everything has been a pleasure and we’ve had the benefit of coaching along the way as we’ve never developed property before. Our business has been elevated tremendously and the reliability of doing work helps with employee retention. The guys working for us never miss a day,” said Joe Robinson, co-owner Unlimited Carpentry. The Port began working in Evanston with REACH (Rehab Across Cincinnati and Hamilton County), a collaborative effort with The Port, the Landbank, and the Community of Evanston. 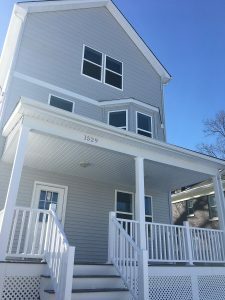 Since commencement of this program, 19 homes have been rehabbed and sold ranging in price from the first home sold at $79,900 to a recent sale of $272,000. The program’s intent is to attract new residents, boost long-stagnant home values, and increase the inventory of homes modernized to market standards. The success is clear and obvious in that there has been a 25% increase in median property values, close to pre-recession levels. For Unlimited Carpentry, they are working their way up to their first home sale offering. “We’re making great progress on the new home construction on Ruth. We borrowed from the design look and feel from other properties on the street (1520 and 1522 Ruth, respectively). One key difference with the new construction is that we can build out true 8’ ceilings on the 3rd floor,” said Joe Robinson. According to Joe, the home construction at 1529 Ruth will be complete in the next 120 days. But it hasn’t all been an easy journey. 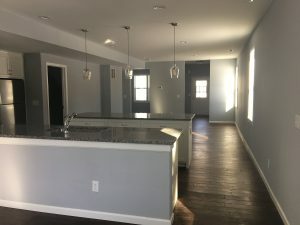 Now complete, the home is about 3,000 square feet, with a full basement ready to finish. One of the goals for The Port in investing in any neighborhood is to plant the seed for others to come in and continue to make it better. This has been the case in Evanston, where Joe noted that someone bought a property next door to one of the rehabs and has been painting and fixing it up. This is one of many examples and the community of Evanston continues to thrive. Neither Joe nor James are Cincinnati natives, but once they arrived, made a choice to stay. Joe and his wife, Janice, have three sons, aged 14, 19, and 20 and love the area and affordability of Greater Cincinnati. James relocated here with his wife when she was a student at UC, and they’ve stayed. They both fell in love with the urban life, after having grown up in a rural river town in south eastern Ohio. They are raising their family here and enjoying all the city has to offer.